Many industry experts believe that as 5G is adopted, it will cause a paradigm shift, sometimes referred to as the "Mobile Industrial Revolution," a "Fourth Industrial Revolution," or "Industry 4.0." 5G will create the crucial communications links needed to connect billions of smart devices to the Massive Internet of Things to produce major productivity enhancements across industries and governments. 5G will also expand into a new area of mission-critical services that will require high reliability, ultra-low latency, strong security and availability. Use cases include industrial automation (smart factories) using sensors, inventory controls, and robots; urban infrastructure monitoring and management (smart cities); utility monitoring, metering, and control (smart grid); autonomous vehicles including cars, trucks, construction equipment, mining equipment, buses, and trains; agricultural automation including self-driving tractors and soil sensors that manage irrigation and alert the farmer when to harvest; autonomous drones for video inspections, surveillance, and product delivery; and remote patient monitoring (telemedicine). Early on in its rollout, the internet was often called the Information Superhighway because networks are like roadways. They are designed to carry traffic for an average traffic load but experience choke points at different times of day based upon traffic volumes. Wireless operators rolled out fourth-generation (4G) LTE technology to enable more traffic to be carried more efficiently on the network. 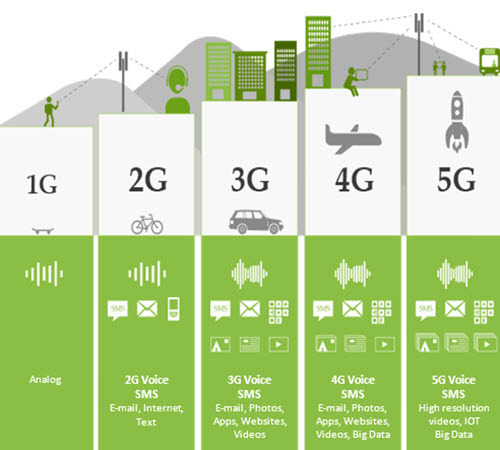 5G technology promises to create exponentially more network capacity. Small cells will be required to be attached to many more poles and other street furniture to realize this vision. 4G and 5G technologies are bringing the antennas closer to the user and lowering the power needed. This process is called network densification. It uses new technologies such as small cells to fill in the gaps and bring many more lower- power antennas closer to the user. In the diagram below, the three cells represent cells in a 4G network. 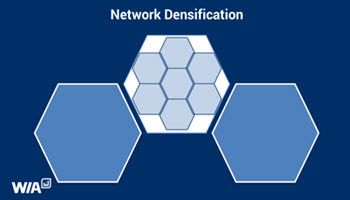 The 5G network will add small cells to densify each cell by creating small cells inside of each cell. This will greatly impact both coverage and capacity.